Mia has been sold as a bride to the cold-hearted prince. She doesn’t want to be a princess; she wants to be a hunter. She wants to hunt down her mother’s killer. This story started out on a strong note. Mia is headstrong, science-minded, and not the flighty type. She’s stuck in an arranged marriage and doesn’t know how to get out. I liked the concept where girls have to wear gloves. It had a fairy-tale feel to it. This book is described as a “feminist fairy tale.” I think the feminist ideals in this book went a little too far on the extreme end. There’s a lot of lesbian themes – not that I’m saying it’s a bad thing. It was too much. All straight men are presented as lust-driven bigots rapists, and it irritated me. It’s reiterating the ideal that straight girls and straight boys can’t have platonic relationships. This book creates a society in which woman are so extremely oppressed that they are forced into marriages, brothels, and the king’s keep (to be whores and maids). It doesn’t present a healthy view of marriage, of love, or male/female relationships. This whole book presents marriage as negative, straight men as evil, and heavy anti-man perspectives. This book could have been so much better had it not been so far on the feminist extreme. This book slammed to a halt in Part 4, when rather than plot and story we learned about magic and life and love and BLEH. By the time I got to Part 5, I was skimming. 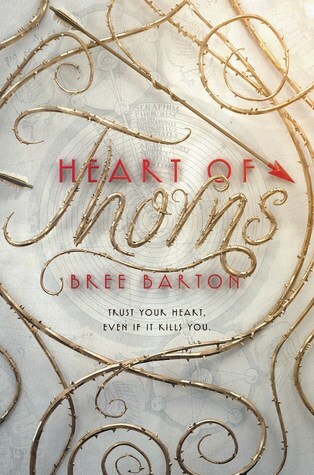 On the bright side, Heart of Thorns is highly readable. The writing is good. But it does that thing that a lot of YA does where emotions pop up suddenly and characters do things or say things that doesn’t seem like they should have – to further the plot or stir tension between characters. So, overall, Heart of Thorns gets a 3 out of 5. It’s readable, but it lacks…substance. It doesn’t feel immersive. It’s sexists. It’s boring at times. I will not be picking up any more of this series. That’s a shame. The book cover is so pretty. From what you describe, it doesn’t sound like something I would read. Thanks for sharing! I agree. I had high hopes. The first third was great, then it just went downhill.